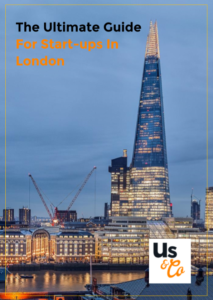 Download our FREE e-book discussing the London start-up scene and our top tips for thriving as a start-up in the UK capital. Click the link below to download. A thriving, populous city at the heart of global finance, technology and entrepreneurship, London is one of the most popular locations for start-ups in the world. There are currently an estimated 205,000 start-ups in the city, and that number is expected to continue growing from year to year. Here at Us & Co, we have witnessed this first-hand. Our clientele of co-workers and private office members includes freelancers, start-ups and SMEs from a range of industries. We’ve seen new brands thrive into flourishing industry leaders and professional partnerships blossom within our very walls. However, we have also seen the day to day reality of the trials of running a new business, whether you’re a one-man-band or a small team. Especially in big, bustling and expensive cities, the pressures of juggling your workload, finances, professional relationships and company admin can be extreme. If you are interested in learning more about renting private offices, fixed desks, hot-desks or meeting rooms in London or Dublin, please check out our website.